12 months risk-free warranty. We will solve all your problems within 24 hours. a. The charging speed is mainly determined by the output of the charger. When using the 5V 2.4A charger, the maximum charging current is close to 2.4A. b. Please not use the charger with output voltage of 5V or more than 3A for protecting your devices. [FAST SPEED] Thick tinned copper wire ensures faster charging and syncing speed. 480Mbps data transmission and 2.4A max charge current provided. 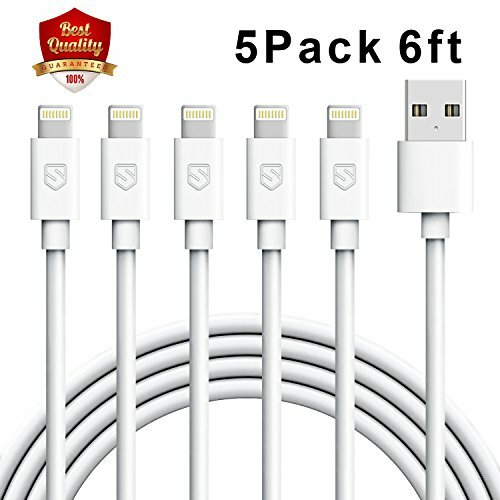 [AFFORDABLE PACK] Enjoy an inexpensive 5Pack high-quality cables in one package. 6FT cord allows you to freely charge your phone without restrictions. [COMPACT CONNECTOR] Easily and firmly plug into the lightning port without loosing. 8-pin connector ensures stable current transmission. [DURABLE MATERIAL] High quality TPE shell is more durable than conventional PVC material. It is comfortable and smooth to touch. [1-YEAR WARRANTY] 12-Month replacement and refund warranty. Welcome to contact us when you meet questions.